I mean, really, dear reader. Do you trust anything the mainstream media tells you? It’s true! Hope does spring eternal! 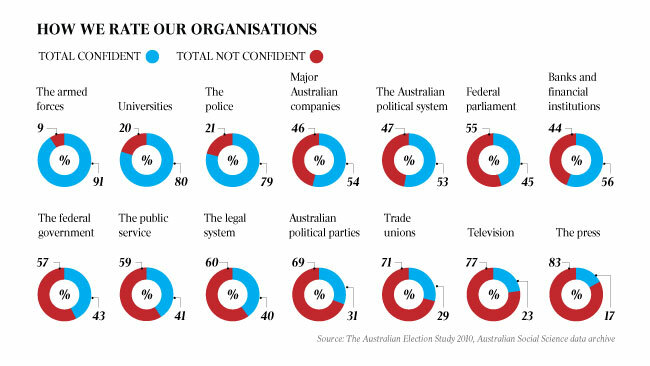 Only one organisation in Australia is viewed, statistically speaking, as totally untrustworthy: the media. The scoop in the 2010 Australian Election Survey, published this week, wasn’t so much that the messenger finished last but that the gap between us and the political institutions we are supposed to hold to account was so wide. Only 17 per cent of voters polled at the last election had confidence in the press, compared with 53 per cent for the Australian political system, 41 per cent for the public service and 31 per cent for the political parties. Still a long way to go on disbelief in the political “system”. And in the “parties”. But at least we are heading in the right direction with distrust for our mainstream “news” sources.